The symptoms of lower rib pain, also known as twelfth rib, rib-tip syndrome, and clicking rib syndrome, are unmistakable. 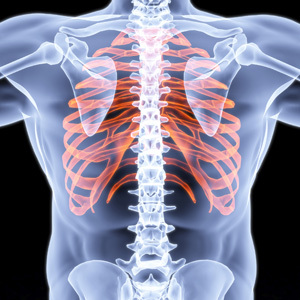 If you are experiencing severe pain while breathing deeply or moving in certain ways, you may well have lower rib pain. While the symptoms are easy to recognize, the cures may be more difficult. There are many different things that can attribute to this uncomfortable problem and this article will hopefully help you understand some of the many causes that may be causing you discomfort or pain. Cracked and/or bruised ribs - These are probably the most common cause for lower rib pain. Many times when the ribs are cracked or bruised, breathing, talking, and normal daily activities become almost impossible depending on the severity of the bruised or cracked rib. Costochondritis – An extremely painful inflammation of the cartilage near the breast bone, this can be caused by a virus such as a cold or the flu. Also known as Tietze’s Syndrome or Costosternal syndrome, this can affect everyone from infants to seniors. In some cases, there is no apparent cause of this inflammation. Most treatments are aimed at lessening the patient’s pain while the inflammation is expected to heal or dissipate in time. Osteoporosis – This is another common cause of chest pain. This is a disease of the bone that will increase the risk for fracture. This is mainly found in women but has also been known to develop in men or anyone experiencing hormonal disorders. There are treatments for this disease, but exercise and general body maintenance will greatly increase the odds of improving the condition of osteoporosis. The most common medications for this disease are calcium and vitamin D to maintain the bone density that remains. Sternocostoclavicular hyperostosis or SAPHO is a syndrome that and can involve the anterior side of chest wall. Fibromyalgia is another pain that can be felt near the ribs. This can disturb your sleep and may lead to fatigue. This is a condition of the nervous system that is characterized by pain without a specific cause for the pain. Due to the many different causes of chest pain and lower chest pain, it is recommended that you see a physician and discuss your exact symptoms, pains and discomforts. In some cases, lower rib pain can be indicative of a more serious problem, so it is always best to consult your physician if you are in doubt. Are you experiencing any other pains with your chest pain? Have you had any past damage to your ribs or chest area? Where is the exact location of the pain? Has the pain been progressively getting worse? How long have you been having chest pains? Is the pain a sharp pain or a dull pain? Is the pain on the left or right side? Or is the pain equal on both sides of the chest? Does the pain get worse with heavy breathing and/or coughing? Does the pain feel like pressure? Sometimes this may be a symptom of heart attack. Are you feeling more pain during physical activities such as bending and twisting? Is the pain steady and consistent and present all of the time or does the pain only occur during certain times or activities? Unfortunately, some lower rib pain can only be treated with time and rest. Other times, pain can indicate a more serious problem. If your family physician recommends time and rest and the pain does not improve within the next couple of weeks, you should have the condition reevaluated, as it could indicate a more serious ailment.